In a memorandum sent to authorized purchasers, the US Mint indicated that their inventory of 2010 American Gold Buffalo Bullion Coins has been depleted. Furthermore, no additional inventory will be made available. The American Gold Buffalo is the one ounce 24 karat gold bullion offering of the United States Mint. The coins have been available for precious metals investors each year since 2006. Based on figures available on the US Mint’s website, sales of 209,000 of the 2010 Gold Buffalo bullion coins have been recorded since the start of sales on April 29, 2010. In the previous year, the US Mint had sold 200,000 of the 2009 Gold Buffalo bullion coins during a shorter availability period between October 15, 2009 and December 4, 2009. The collectible proof version of the 2010 Gold Buffalo does remain available for sale from the US Mint. These coins also contain one ounce of 24 karat gold, but feature a cameo proof finish created through a specialized minting process. The collector coins are currently priced at $1,560 each, with the price subject to adjustments based on the price of gold. 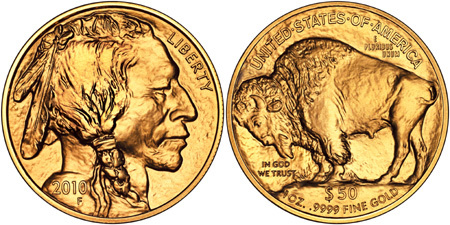 Through the last available sales report, the US Mint has sold 31,896 of the 2010 Proof Gold buffalo coins. Besides the Gold Buffalo, the US Mint also offers the American Gold Eagle bullion coins. This series includes one ounce, one-half ounce, one-quarter ounce, and one-tenth ounce coins struck in 22 karat gold. At this time, sales of 2010 American Gold Eagle bullion coins are still ongoing and proof versions of the coin are planned for release on October 7, 2010. Why wasn’t the text of the US Mint’s memorandum to authorized purchasers included in this story? Coin Update either has a copy of the memo, which it could publish, or it does not have a copy, in which case it is reporting hearsay or making up the story.